Your hair goes through a lot; from pollution, to chemicals, blow-drying, stress and dehydration. 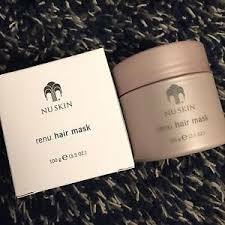 Just like you, you hair works hard for you all week and it is time to return the favor with Nu Skin® ReNu Hair Mask. This deep conditioning treatment provides critical hydration by penetrating the hair shaft and tripling the strength of damaged hair. Featuring CS7, an innovative cuticle smoothing agent that acts as cuticle glue to seal and strengthen each cuticle, this mask prevents split ends and breakage, making hair smooth, shiny and manageable for up to seven days. enables you to lock-in youthful luster all week long.